We have compiled a list of the most enchanting castles on the Camino de Santiago routes and where to find them! From France to Portugal, medieval times right up until the nineteenth Century there is no shortage of magical castles on the Camino routes. The charming town of Ponferrada is the last major town on the French Way before reaching the final destination of Santiago de Compostela. Situated on the Sil river and completely surrounded by mountains, the castle is quite the spectacle. The impressive castle gets its name from when Ponferrada was placed under the protection of the Knights of Templar in the 12th Century. 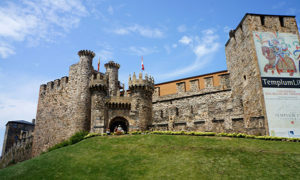 Built in the style of a Galician manor house, enveloped by the walls of a medievel fortress, the elegant Parador of Baiona really illustrates the meaning of luxury. Not only is the Parador itself beautiful but from its vantage point a top of a rocky promontory visitors can take in the most spectacular views of the Atlantic Coast. The best thing about Baiona’s beautiful parador is that it is available for accommodation on the Portuguese Coastal Way. Ornate decour, deluxe bedrooms and o course wonderful scenery are all part of what gives a stay in the Parador of Baiona that feeling of luxury. This idyllic castle is one of the most fairytale-esque castles on the Camino. 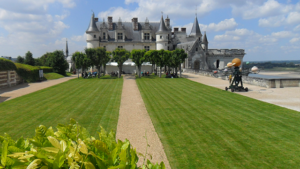 Positioned high over the town, overlooking the Loire, the chateau is visible before you even enter Amboise. The castle’s varying style’s take visitors on a journey through history, deviating from Gothic to early Renaissance right up to the 19th Century. Natural defence provided by the river below. The chateau has a number of claims to fame with Joan of Arc having passed through on her way to defeat the English at Orleans in 1429, today the chateau’s petite chapel is said to be the burial place of Leonardo da Vinci. Amboise features on section two of the Paris and Tours Way. The Andrade tower in Pontedeume is a stunning example of medievel military architecture in Galicia, dominating the Pontedume valley. The tower we see today is what remains from the Palace of Anrade which was demolished in 1909. In the square next to the tower, the Praza do Conde a weekly market known as the Feirón takes place every Saturday. 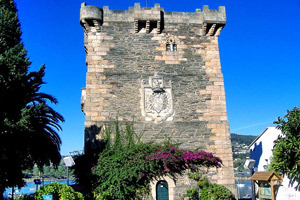 Today the tower is owned by the Duchess of Alba and you can find it on the English Way Camino. Located off the north-western coast of France. Known as The “Wonder of the West”, The impressive gothic abbey of Mont Saint Michel stands towering over the walled city. Throughout its long and turbulent history, the Mont has been reincarnated in various forms. Beginning life as a Benedictine Monastery it was used as a jail during the Ancien Regime. Today it is one of France’s most cherished landmarks, attracting more than three million visitors each year. 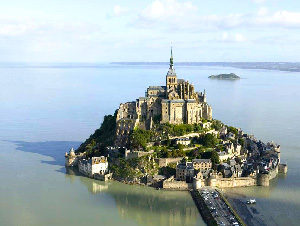 This spectacular sight is the starting point for the Mont Saint Michel Way.